"This dish is a big hit at my house, especially served warm with ice cream." Preheat an oven to 375 degrees F (190 degrees C). Lightly grease a 9x13-inch baking dish. Mix the rhubarb, peach, white sugar, and 1/4 cup flour together in a large bowl until evenly combined; pour into the prepared baking dish and spread into an even layer. Stir the brown sugar, quick oats, and 1 1/2 cups flour together in a separate bowl. Cut the butter into the flour mixture with a knife or pastry blender until the mixture resembles coarse crumbs; sprinkle evenly over the rhubarb and peach mixture. Bake in the preheated oven until golden brown on top, about 45 minutes. 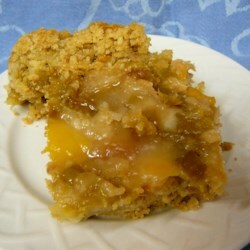 Filling was perfect consistency, but the crumble was not what should be expected. I added 1 tsp cinnamon and 1/2 tsp nutmeg and 1/2 tsp vanilla extract. I might do heaping tsps next time. Tasty base recipe to use. Great recipe. I used a few more peaches but would cut back the sugar to 1 cup next time it was plenty sweet. Very good. I only had 3 cups of rhubarb so used 3 cups of frozen mango since I didn't have peaches. Good basic recipe. Used mixed berries instead of peaches. Cut back on the sugar.